The NASA News item NASA’s New Shape-Shifting Radiator Inspired by Origami describes a technique for spacecraft temperature regulation combining both a shape-changing surface and an emissivity-changing material applied to it. I don't understand what is really happening here. How can one shape be better for cooling (radiating into space) while another be better for warming (presumably from sunlight)? Wouldn't you just want the maximum area? It seems the deeper the folds, the smaller the total area exposed to the environment. To reiterate, the deeper the folds, the smaller the cross-sectional area because the total amount of surface is fixed. Is it really true that a smaller cross-section with deeper folds is better than spread out and planar? This novel radiator controls the rate of heat loss by performing shape-shifting maneuvers. The resulting topographical changes could be achieved with temperature-sensitive materials like muscle wire or shape-memory alloys. As temperature-sensitive materials experience a change in temperature — caused by spacecraft electronics or the absorption of heat from the Earth or sun — the radiator could automatically change its shape to either shed or conserve heat. The deeper the folds or cavities, the greater the absorption, explained Mulford, adding that scientists have investigated the use of cavities to affect heat loss for nearly 100 years, but no one has approached the challenge in quite this way. 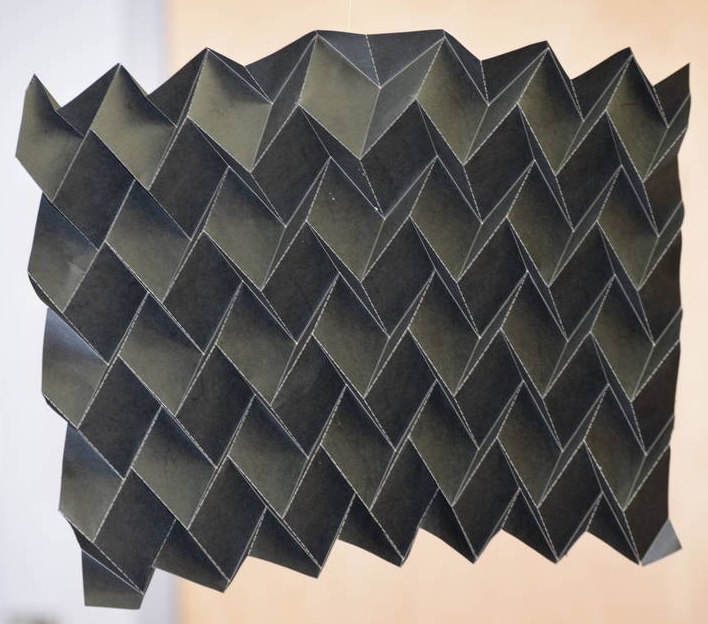 “Origami allows you to change the depth of these cavities in real time, thereby changing the heat loss from a surface in real time,” he said. I just saw this and recognized my research, ha ha. I realize this is an older question but I wanted to give my two cents. The published article is a bit deceitful in describing the technology (which frustrates me) so I wanted to straighten things out. You are exactly right in that the finite surface area will offset almost any gains from increases in radiative surface properties. 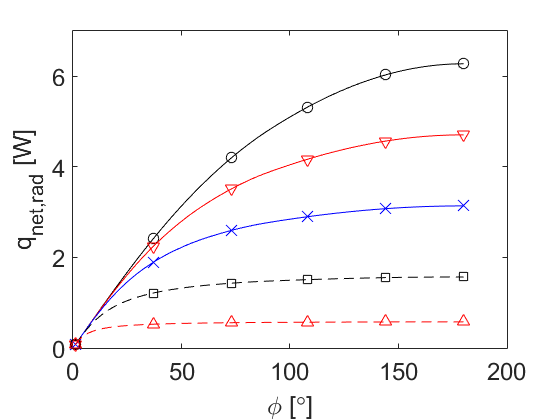 The first plot below shows how the apparent absorptivity and apparent emissivity of the surface openings will change as the V collapses from fully open (phi of 180 degrees) to fully closed (0 degrees) for a diffusely-reflecting surface. Each line is for a different intrinsic absorptivity that is inherent to the material. As you can see, the apparent absorptivity approaches one for all cases. However, as you have pointed out, the surface area of the radiator is decreasing. 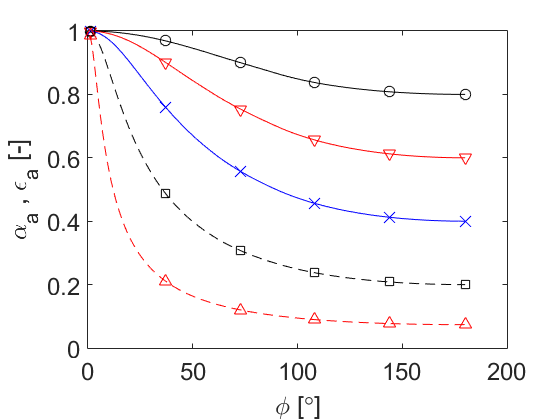 The net effect is that the total net radiative heat does indeed decrease as the surface collapses (see Figure 2 which is for the net radiative heat transfer of a diffusely-reflecting surface and several different intrinsic absorptivities). This still gives us significant control, though, over the heat transfer from the radiator just in the opposite direction that we originally intended. We are also exploring a variety of surfaces that either don't collapse to zero surface area or that maintain a given surface area while changing the cavity angle. See the presentation linked below for more of that information. I have also included Figure 3, which shows how the heat transfer of a specularly-reflecting (or mirror-like reflection) radiator behaves as the radiator collapses if the incident irradiation is collimated, or all coming from one direction (as is the case generally for solar irradiation). 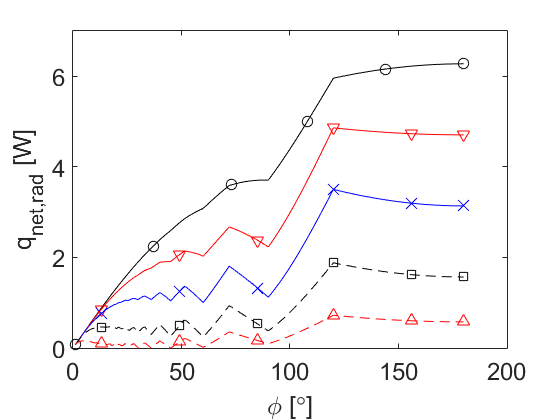 Here the multiple reflections combined with the singular direction of irradiation gives very erratic behavior and significant changes in heat transfer are possible over small actuation distances. See slides 23 - 29 in this presentation for more of the math, experimental procedures, etc. Should have a paper soon talking about the behavior of net radiative heat transfer with actuation. going on intuition: when a photon hits a surface, it's either absorbed or reflected. On a flat surface, this is easy: if the photon is reflected, it'll travel away from the spacecraft. When a photon travels into a cavity, it'll have to be reflected multiple times to get out of the cavity again, so there are multiple chances for the photon to be absorbed. The absorption coefficient is multiplied by the average number of reflections needed to get out of the cavity. Not the answer you're looking for? Browse other questions tagged artificial-satellite design thermal thermal-control or ask your own question. Are 2 satellites joined better than 2 apart?